After some time off for the Summer, it’s great to see Virginia Wine Chat has returned. On the last Saturday of September we sat down and did our usual virtual tasting with Frank Morgan (Drink What YOU Like) and some Virginia winemakers as we tried wines, shared our thoughts, and got to see what was, at least in my opinion, one of the best discussions we’ve had during the series (at least that I’ve been a part of). 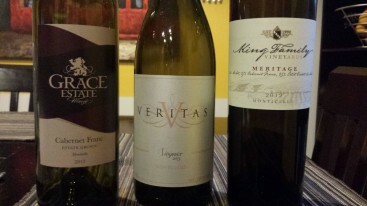 Unlike in previous months, September saw us trying wines from three different Vineyards – Veritas, Grace Estate, and King Family. The video stream is embedded below, and I highly recommend checking it out – it really was a great discussion about wine, Virginia, and how the two meet. But, as always, let’s talk about the wines. A blend of 95% Viognier and 5% Petite Manseng I picked up some honey on the nose and in the mouth, along with some Tropical Notes. The typical floral notes that I usually find in Virginia Viognier were toned down in this particular wine, but it was still crisp, refreshing, and showed just a hint of effervescence, making it a great porch wine or pairing with some spicy food. I’ll admit that I’ve never been out to Grace Estate, but following this tasting, they’re high on my list. I really liked this Cabernet Franc, which is a blend of 92.5% Cabernet Franc and 7.5% Petit Verdot. The wine was light, but showed great notes of meat/bacon/smoke and had a nice clean finish. There was a surprising lack of pepper, something that I’ve come to associate with Virginia Cabernet Franc, but it was still a great wine, and a great value – one I would highly recommend and easily my favorite of the night. A blend of 42% Merlot, 27% Cabernet Franc, 25% Petit Verdot, and 6% Malbec, the 2012 Meritage from King Family showed dark fruit and some jamminess, but with a smooth finish and just a bit of spice and chocolate at the end to make it a very luxurious wine. Another excellent wine, I’ve enjoyed King Family the few times we’ve been out there, though I admit that I’ve yet to go out and enjoy the polo games they have there (but I’ve heard it’s a great way to spend an afternoon). As usual, all of the wines were excellent – the Grace Estate Cabernet Franc was my favorite, but there’s not a one of them that I’d have been disappointed to find in my wine rack. Check out the video below to see how the conversation went (the discussion about screw cap vs cork was extended and interesting), and don’t forget to visit the wineries to try their wines, check out the conversation online (#VAWineChat), and check back in October for another great tasting.